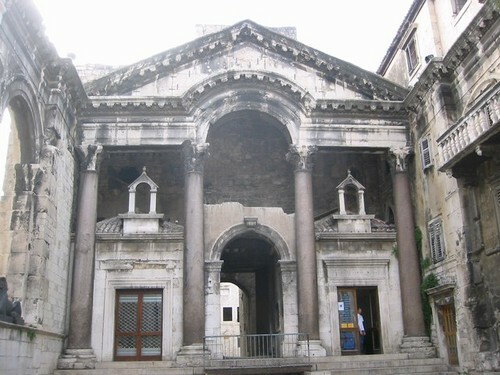 the following morning, i decided to go w/ damian and ira to the town of Split. croatia is mainly comprised of two parts. there is a lrage wide part in the north (and zagreb, the capital, is in the middle of it) and then there is a thin strip going down the coast for hundreds of miles. this strip is filled w/ coastal towns and beautiful islands. 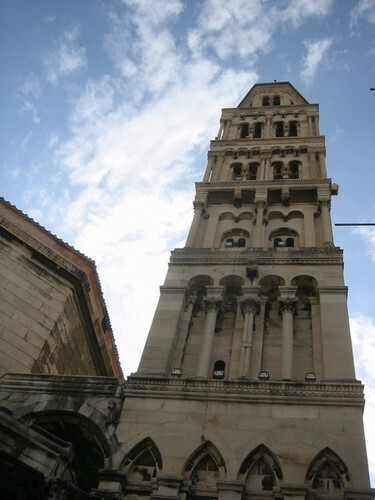 Split is croatia’s second largest town, and is about 7 hours by bus down the coast from zagreb. it’s a really really old city, and the most important part of it is the old town built over the remains of ancient palace used by a roman emperor. on the way down the coast, i read up on the history of croatia. so crazy!! unfortunately, i’m usually very unknowlegeable when it comes to history,a dn although i knew that there was a war here etc, i didnt really know why it happened, or anything about it. it was actually super interesting to learn about the history of croatia (along w/ the history of serbia and bosnia). i’ve never much been interested in history, but over the last several weeks i’ve become very fascinated by it. it’s just so interesting how things cause each other, and just how many changes happened to each country. unlike america, that has only been either part of the uk, or it’s own entity, so many of the countries here have changed hands countless numbers of times. also, reading all this really made me want to explore more around here… to see eastern europe, and also to see bosnia, serbia, albania etc now thta these countrie are finally accessible and safe. wehn we got off the bus, we were virtually attacked by all these old yelling croatian ladies tryin to rent us a room for the night. “rooms! rooms!! close to center!! CENTER! !” they all screamed, while thrusting their fingers at maps to show that indeed, the rooms were close to the center of town. we tried to escape the old ladies, but they followed us “CENTER!!! close…. CENTERRRRR!!!! !” it as madness! finally, after getting past the old ladies, another woman came up to us, and just to be different said “room!! center!!! close, CENTER!!!”. sheesh! well, she was persistant, and even after we said no and walked off, she just followed us. to make a long story short, we ended up staying in her room, which was actually not all that far from center (although it was of the map!). we actually got a really good price, the room was clean, and they gave us turkish coffee. we ended up being very happy w/ our choice. after walking around a bit to explore (in the dark), we went to this locals restaurant on the coast. this place didnt even have a menu, instead the waiter just rattled off hat we could choose. ordering was confusing, and in the end, we werent sure what we would get. in the end though, it was all very good: a bean stew w/ roast pork to put in it (very traditional in croatia), black squid risotto (it’s black from the squid’s ink), and a variety of fried fishes. all of it, along w/ 2 large .5 liter beers each, only cost us like 10 bux a piece. not bad!! croatia definitely isnt dirt cheap as i hoped, but it is realitvely inexpensive. i’ve paid about 13$ per room most of the time… but the internet here is wayyyy bank… 5$ per hour! during dinner, ira and i had a pretty intense discussion about religion, the role it plays in the modern world, and along w/ it, the upcoming elections. i’ve been trying to read up on the election stuff as much as i can while traveling by buying american magazines or british newspapers. it’s all so nuts. i really really hope that i can be in a place where i can watch tv when the election happens. maybe i’ll get a room w/tv specifically for that. although, ečlection results will probably b announced at like 4am here! in the central palace area, there is this huge tower and we climbed to the top to look out over the city. great views of all the red roofed houses from up there. soon enough, it was time for me to go. it was kinda sad to leave the group. i’ve never traveled w/ random people that i didnk know before, and it was actually really fun. both fo the guys were cool, and we all had a good time. heh, ira had a laptop w/ him, and he downloaded all these hilarious short clips from the net for us to watch. i guess this guy on the net chopped up and modified the old giJoe public service announcements (remember “and knowing is half the battle”?). we would watch these over and over again laughing hysterically. if you’re interested, check ’em out at: http://www.fenslerfilm.com . theyre kinda odd the first time you see them, but get funnier each time. Yay! I’m so glad you’re making friends! Sounds like you’re having a swell time – I’m jealous! Speaking of the election, are you voting by absentee ballot or something? Regardless, Kerry’s sure to take California – THANK GOD! I’m pretty worried though; I wouldn’t be surprised if we’re stuck with Dubya another four years. *Slaps forehead* My Dad and his girlfriend are seriously contemplating moving to Spain if that happens – can’t say that I blame them.